I figured I’d share a few things I found on Friday. There wasn’t too much, but there were a few things of interest. First off is this angelic shelf. I found it with some old house decorations, so I figure someone was renovating a house that hadn’t been renovated for quite some time. The shelf is made out of a very light wood and it has a very odd texture. Does anyone know what kind of wood it could be made of? It’s in pretty good shape, though it needs a coat of paint. I imagine it’s fairly old as well. Overall, a pretty interesting piece which I took back home with me. I’m not sure if I’ll put it on the wall or try to sell it. If anyone has any information on the specific style or era this came from, let me know 🙂 If it helps, the area I live in was built up around 100 years ago. Some of the old house decorations. I’m not sure what the first thing is, but it looks interesting. I think the latter is that decorative wallpaper you put on your wall up by the ceiling. 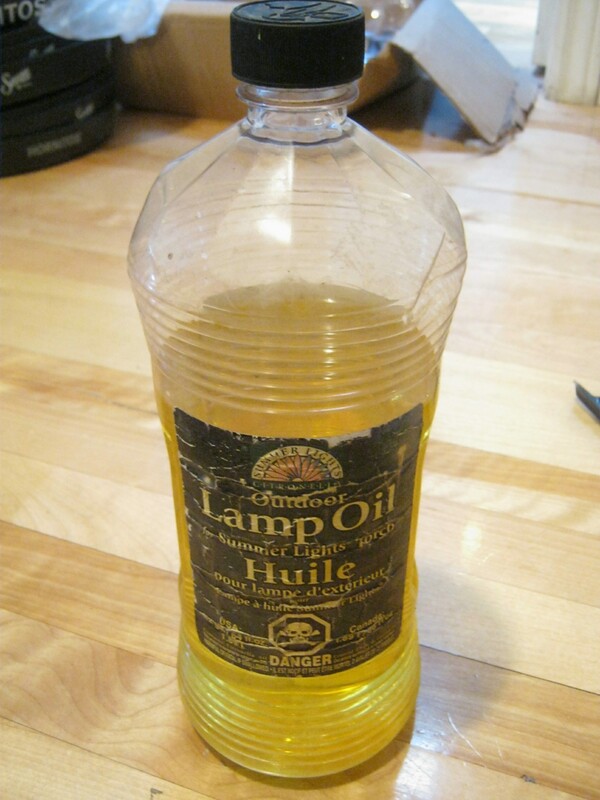 I found this container – mostly full – of citronella lamp oil. I doubt this stuff ever goes bad. I’ll try to give it away to someone on Craigslist. Finally, a fishing reel. Missing the arm but otherwise seems good (according to my friend, who knows more about fishing than I do). I’ll try to give this away as well, although I’m not sure anyone will want it. We’ll see! Worst comes to worst it has a bit of metal, which I’m sure a scrap metal guy could salvage. That’s all for now. It’s trash night tonight though, so maybe I’ll have some more stuff to post about tomorrow! That’s some really interesting architectural decoration you’ve found there. The shelf is divine (pardon the pun). 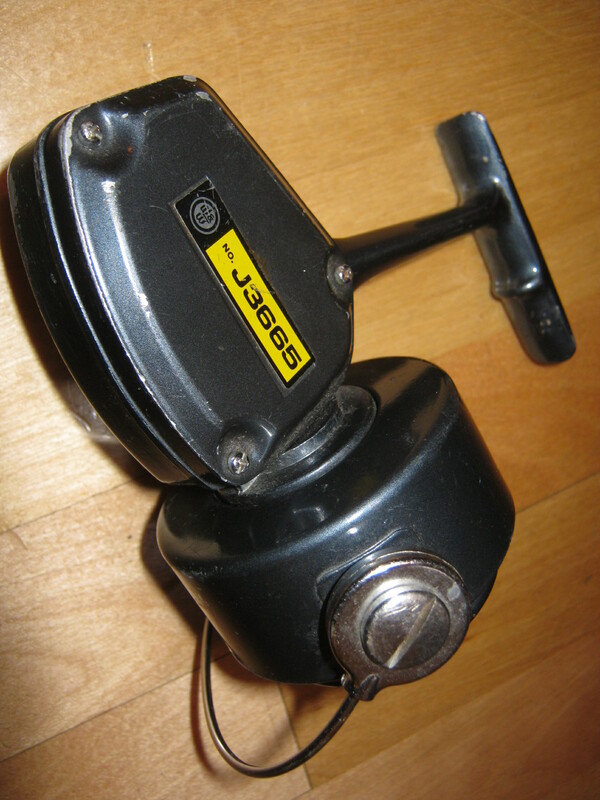 That’s a spin cast (aka a closed face) fishing reel. You might want to check the maker. Some of these can be expensive, so if it’s still working, it might be worth a couple of bucks (or more). I didn’t end up taking the wallpaper. Maybe I should have though. It seemed to be in decent shape. Maybe I’ll see it out again! I looked up the reel and it barely shows up on Google. The brand seems to be more or less unknown, so I’ll give it away. Someone on CL asked me about it, so maybe he’ll take it. Might still be worth a few bucks but it’s easier just to give it away. Cool stuff. That shelf really is quite a find. Always amazed at the things people just cast off. Ok, I live in a 1920s house in Montreal, and I think I know what this is! 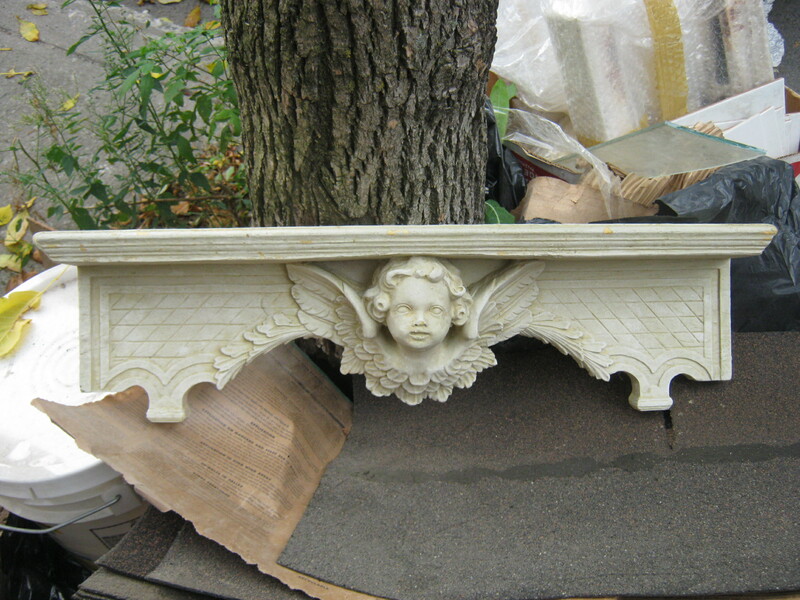 The angel shelf is probably a kind of composition moulding. 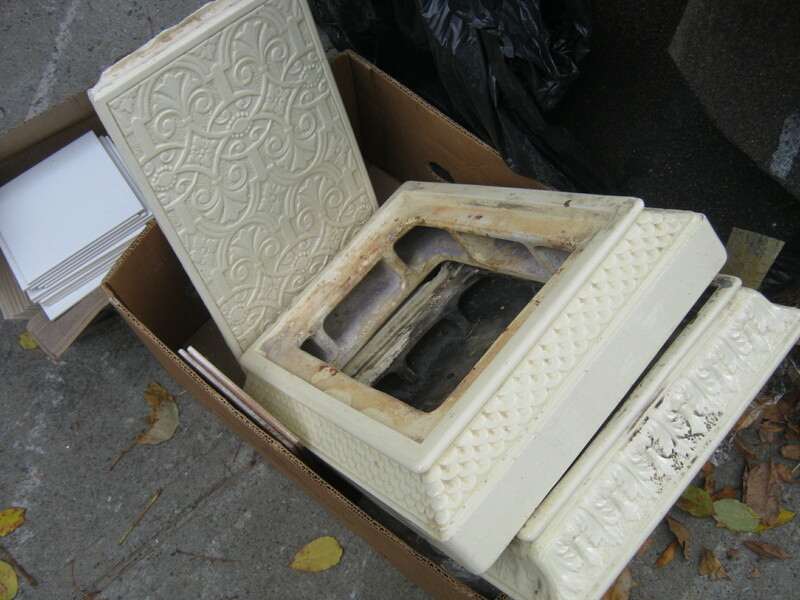 See http://www.oldhouseweb.com/how-to-advice/applied-decoration-for-historic-interiors-preserving-composition-ornament.shtml. I have corbels throughout my home made from it. I see people ripping out these original details and trashing them in NDG frequently. 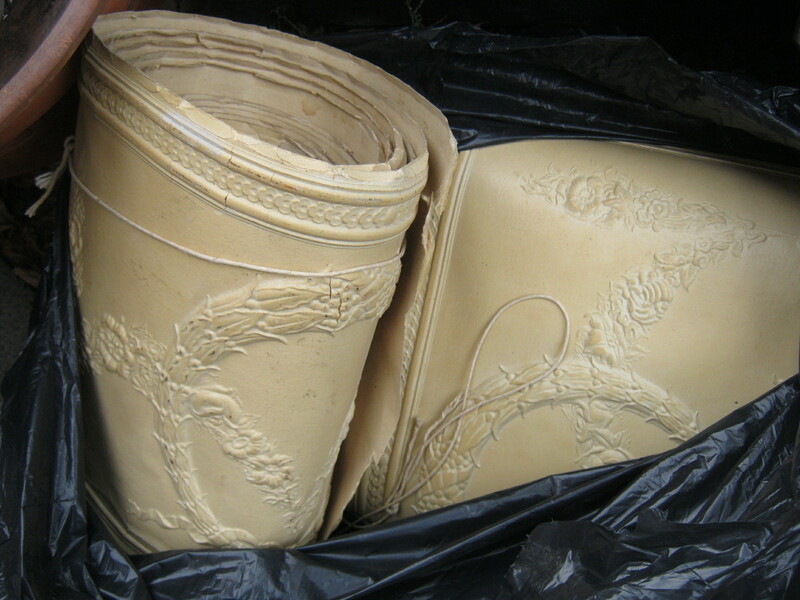 Especially the wallpaper – over time the glue gives out, or the covering itself develops cracks. Plus there’s modern textured wallpapers available for cheap, an easy solution. If you’re looking to resell these kind of architectural features, you might want to try Spazio. At the very least, they could help you id further what you’ve found.